Financing – Kairos Development International, Inc.
Kairos Development, Inc. can provide financing of projects with almost no limit. Projects are evaluated individually for merit, and the most appropriate financing resources are used to fund the project. 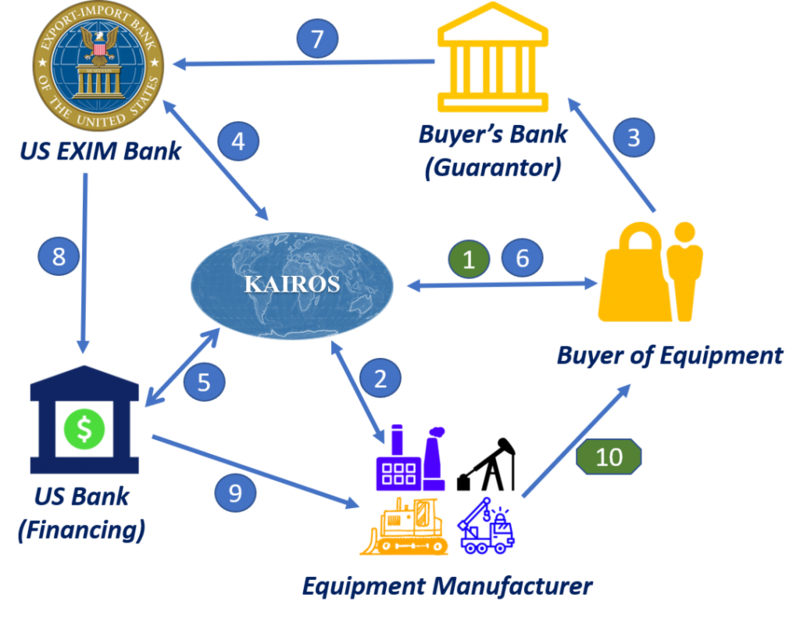 Kairos has experience with Exim Bank, OPIC, and other public and private financing options. Here below one of many possible financing strategies offered by KAIROS in order to facilitate international business. Appropriate strategy is determined for each individual case. BUYER OF EQUIPMENT SIGNS PURCHASE CONTRACT WITH KAIROS. BUYER’S BANK (APPROVED BY US EXIM BANK) REVIEWS BUYER’S FINANCIAL DOCUMENTS AND ISSUES A STATEMENT REGARDING THEIR WILLINESS TO GUARANTEE THE DEAL. KAIROS SIGNS A LETTER OF INTENT WITH EXIM BANK. US BANK OPENS A LINE OF CREDIT TO KAIROS. BUYER MAKES AN INITIAL PAYMENT TO KAIROS (TYPICALLY 15-20% OF TOTAL PURCHASE PRICE). BUYER’S BANK ISSUES A GUARANTEE TO US EXIM BANK (TYPICALLY FOR 5-7 YEARS FOR 80-85% OF THE TOTAL PURCHASE PRICE). US EXIM BANK ISSUES A GUARANTEE TO US BANK. KAIROS ACTIVATES PURCHASE ORDER TO THE EQUIPMENT MANUFACTURER. KAIROS SUPPLIES EQUIPMENT TO THE BUYER.